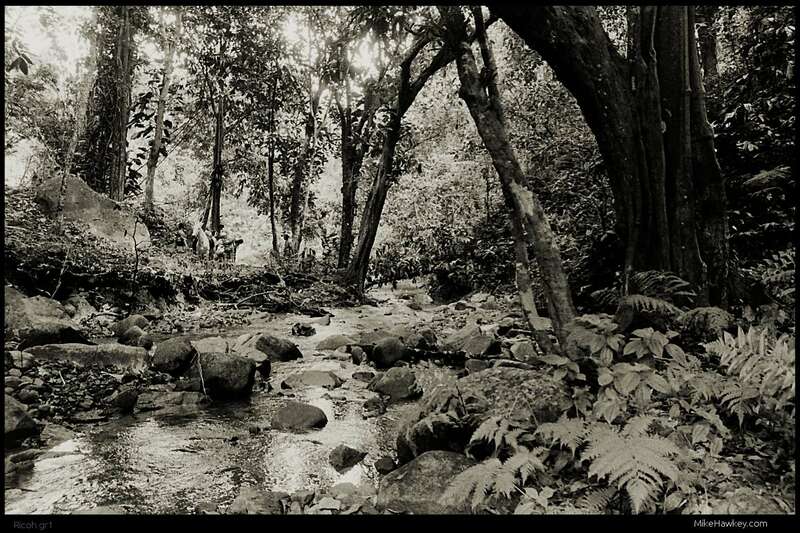 Another 35mm film shot from my Ricoh GR1 in the forest of Fiji I walked through to get to a waterfall. Following the river down, we can see the irritated horse I featured a the day before last (I think its the one anyway), before the river disappears into the forest. Not a lot more to say about this image as we reach mid-week and I am slowly getting back into the ‘work mode’ – Its funny how just over a week away can both go by so quick, yet seem to last so much longer. I’ve never been to good at getting back into the swing of work after a holiday away! Photo wise, after scanning the film I used Gimp to play with the levels slightly, apply a sharpen and give the image a very slight sepia like tone. Whilst I have had a camera on me at all times, I have not really taken many images so far this week. I still have a few more of Fiji I want to share before getting back to my local production, so there is no chance of running out of images anyway! Cheers. Was a great place to walk through.